Harry Grant Dart had quite an eye for the future. The early 20th century illustrator imagined women driving flying machines, the airmail of the future dropping from the sky, and even a world of robot butlers long before the word robot had even been coined. 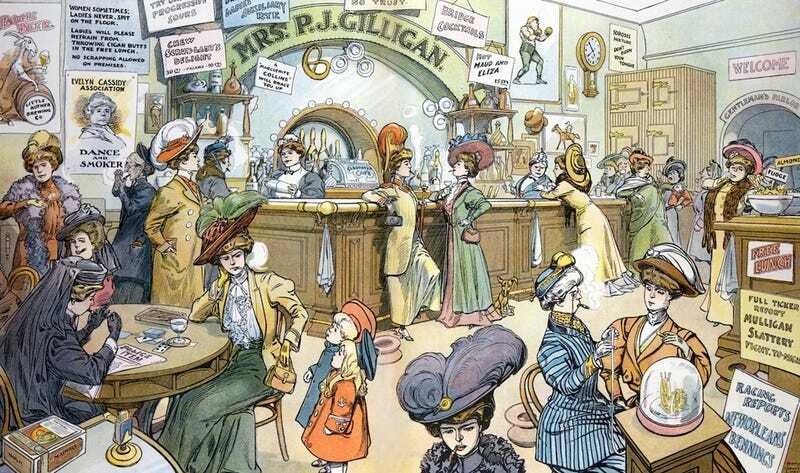 But one of Dart's illustrations from 1908 was perhaps the most startling for people of his generation: a bar filled with nothing but women. Futurist visions serve many purposes. And for Puck magazine, that purpose was usually satire. The Appendix has a great look at Dart's 1908 drawing of a women's-only saloon—a satirical look at the rise of American women in the public sphere. Women are seen drinking, smoking, gambling, checking a stock ticker, and neglecting their children with the kind of disdainful glance more stereotypical of a boozed-up father from the turn of the century. As an interesting side note, Prohibition gets much of the credit for normalizing women in drinking establishments. Formerly the exclusive domain of men, both men and women started showing up at the same speakeasies after alcohol had been made illegal.